Angel Olivera Couture is an atelier in the old-world tradition, located in the heart of Indianapolis, IN. that will be as beautiful and unique as you. Born on The Isle of Enchantment in Ponce, Puerto Rico, Angel showed an early interest in fashion. He began his journey to follow his dreams by attending the International Fine Arts College in Miami, Florida. When the opportunity presented itself to work with famed Puerto Rican designer, Carlota Alfaro, Angel left Miami to work as her assistant and apprentice. It was under her tutelage that Angel completed his degree in fashion design from her private school. Angel's career in fashion began in 1998 when he won the Kermesse de la Moda, or Fashion Competition, in San Juan. This renowned design competition brought together new and upcoming designers from around the island. The attention brought from his win allowed Angel the opportunity to work with TV personalities, musicians, and other noted performers on the island. As his work for famous islanders was noticed, Angel also won the prestigious Paoli Award for 1999 as the Puerto Rican designer of the year. The Paoli Award is the highest distinction award for the arts on the island. Angel's designs graced beauty queens for Miss Universe, Miss World, Miss Petite, and Miss International in Puerto Rico, Dominican Republic, and the USA. Because of the exposure of his art off the island, Angel was also recognized and awarded for contribution to the island's culture by the Chamber of Representatives of Puerto Rico. In 2001 the Mayor of Ponce, Rafael Cordero Santiago, bestowed the title of "Distinguished Merchant from Ponce Town" upon Angel for his success in fashion and business. Beginning in 2008, Angel established a home base in Indianapolis, Indiana to continue his journey in the fashion industry and carve out a niche of haute couture -- designed, sewn, and presented to all the fashion conscious. His work has been published locally and nationally. Angel's design won him a position in the top 5 contestants and the popular vote for the nationwide bridal dresses competition of Project Emerald for Brides Magazine. Subsequently, his work was shown in fashion events around the city, held at the Murphy Arts Center, The Vogue, The Jazz Kitchen, The Sanctuary on Penn, The Arts Garden, and The Fort Wayne Convention Center in Fort Wayne, Indiana. His work appears in a fashion avant-garde video on YouTube called, "RockTheModel Cycle TWO." In 2012, he was called to participate with other local designers as part of the Indianapolis Fashion Night Out hosted by Simon Property Group. The same year, Angel was invited to participate in Project IN:spired by the Indianapolis Museum of Art, known today as Newfields, and his design was chosen together with two designers to be presented in a showcase on Fox59 News. 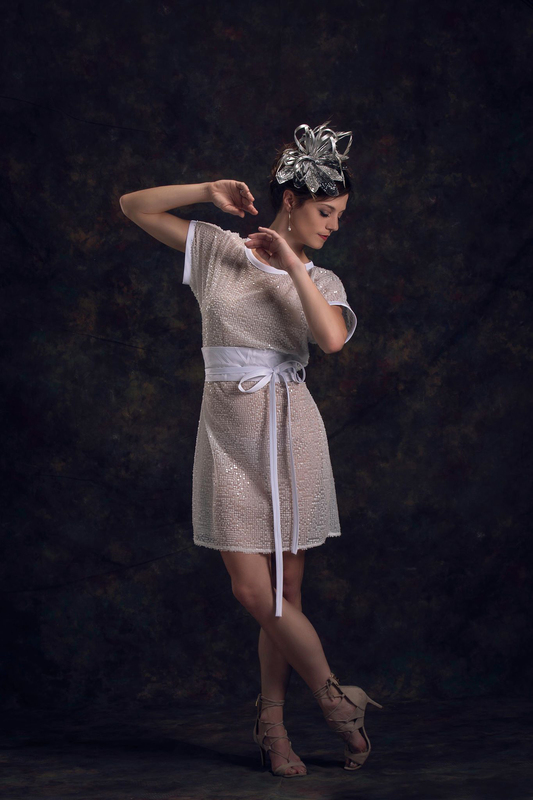 In 2013, Dance Kaleidoscope invited Angel to dress the female dancers of their company for a photo shoot that would be used for the images in their calendar for 2014. That resulted in a show of his designs at the Indiana Repertory Theater in their main exhibition lobby. Soon after, he was invited to be one of the hosts for the TV show "Planeando mis quince" (Planning my sweet 15) on Telemundo Indy. In 2014, M&M Magazine published images of Angel's work and showed nationwide, online and in print. This was the first major publication of Angel Olivera in the US. October of the same year, Angel opened his first studio in the Broad Ripple area of Indianapolis, Indiana. A month later, Pattern Indy presented on their on line edition of the Blog, "No Such Thing as Overdressed," showcasing Angel's work as well as fellow designers. Angel Olivera Couture was also featured at C'EST MOI Magazine's Webitorial-Radost Moya using his looks as the main blog. In March 2015, the Wella Trend Vision Indiana Hairstylist Olympic Team used a dress of Angel for the trends for the season. Angel formerly had the experience to work with Wella in Puerto Rico. Angel was featured again in May in EÑE, a Hispanic magazine in Indianapolis. Angel met the two-time Grammy winner soprano, Angela Brown, who wore an Angel Olivera Couture gown in a majestic presentation with the Carmel Symphony Orchestra at The Palladium in Carmel, Indiana. In August 2016, Angel is remarked as "Maker of the month" by Pattern Indy, and in that same month is celebrated at INlightlN, a light show that featured Angel's looks with elements of light. Most recently in 2017, Angel was photographed for the cover of Indiana Minority Business Magazine with the Indiana legend, designer Alpha Blackburn, and the fashion stylist Sarah Jene. At the end of the same year, the Indianapolis Museum of Contemporary Art (iMOCA) invited Angel to a private event in order to showcase his work among other local designers. 2018 will be the year Angel has the most attended and promoted show, Narciso's Garden, a celebration of his grandmother who loved horticulture, her flowers most of all. Angel's work continues year after year, with zest for fashion and the arts. He enjoys every moment of the interactive art community and values the contribution to society the arts provide. We are your one-stop-shop for custom couture, alterations, and fashion education. All conveniently located. Combining years of skilled tailoring, pattern creation and design into a world-class atelier. Brides, wedding parties, and comprehensive wedding planning. Special occasions, quinceañeras/sweet sixteen, and proms. Complete styling in the comfort of your home including initial design sketching through fabric selections, fittings, hair and makeup for your special event. Beginning through advanced sewing and machine use, alterations, pattern making. These are some of our recent creations. Silk Charmeuse bias dress with dotted Swiss tulle back drape decorated with gold French lace beaded with gold sequins. 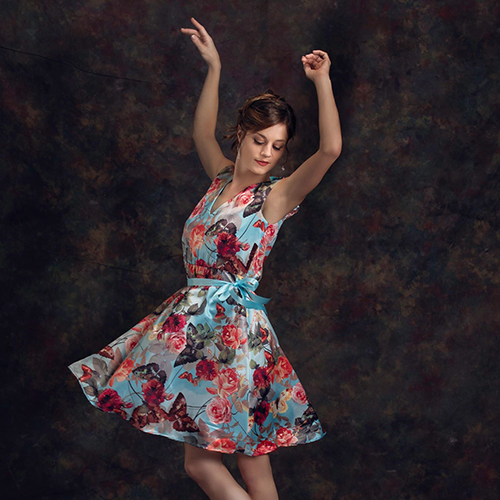 Floral digital print with semi-circle skirt and "V" neck fitted bodice with cap sleeves and silk ribbon as waist tie. White sequined mesh long t-shirt with burn out organza in all white. Black silk charmeuse pantsuit with drape top and custom made lame flowers beaded in sequins, rhinestones and beads. Black chiffon trapeze dress with frontal panel in Magenta chiffon beaded in silver beads with ombré effect. Frontal double slit to create movement. Tied to the waist with chiffon sash. Tie dye magenta color chiffon ball gown with over 12 yards of fabric decorated with petals of same fabric. Silk dupioni corset with pleated chiffon decorated with beads of rhinestones. "Angel has the ability to turn the simple into elegant. His work is so creative and beautful, his designs truly light up a room. If you're wearing one of Angel's designs you can expect a night of being complimented." "Angel is amazing!!! He made my wedding dress. It was such a pleasure to work with him. He took all my ideas and created the most beautiful dress with unique details like hand-cut lace. The craftsmanship was excellent, especially the hidden bodice (that made the dress fit perfectly) and the french bustle. 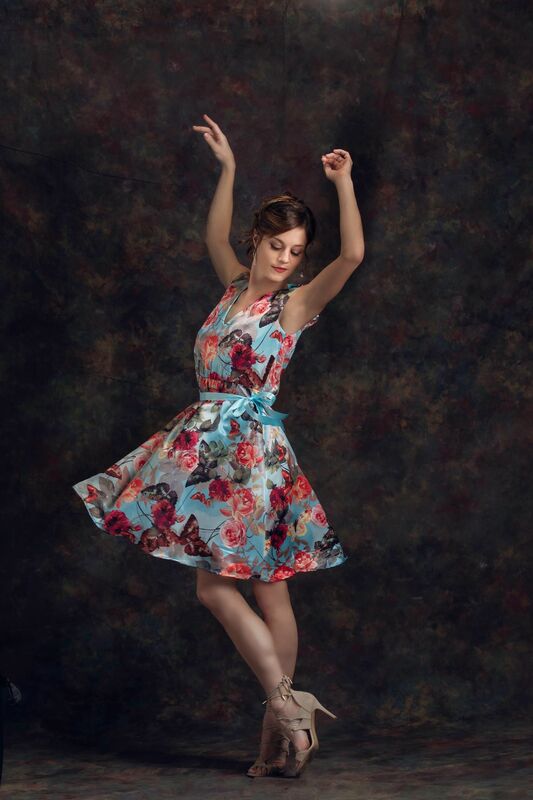 I loved my dress and he was so much fun to work with." "Passionate elegance! Beautiful design, elaborate and intricate -- in one word: perfection! I couldn't have been happier with my wedding dress! Thank you, Angel Olivera!" Get in touch and let's make something great together. Let's turn your idea into an amazing creation. Copyright © Angel Olivera. All rights reserved.